Bad Skid vs Flying Angels Bern in semis. Photo by Ingeborg Kuijlaars. The European Ultimate Championship Finals (EUCF) wrapped up last weekend and put an end to the European club season. The Men’s Division brought 24 teams from all around the continent to Caorle, Italy, just outside of Venice. Here are the main storylines from the weekend. London Clapham is still the best team in Europe and they fought their way to their sixth straight EUCF title. Though they may have shown signs of vulnerability earlier this year, no team was even close at the EUCF. Out of Clapham’s seven games on the weekend, only three teams were able to put up double digits. Bad Skid and PELT lost to Clapham 15-11, while the closest push came from Copenhagen’s Ragnarok, who lost 15-12. Clapham’s offensive line is a force to be reckoned with. The all stars like Justin Foord, Alex Thorne, Ashley Yeo, and David Stobbs seem to be able to score at will. The line was certainly not perfect, giving up many turnovers in the semi against CUSB La Fotta. However, they are also fantastic defenders and were able to stop CUSB La Fotta from getting a single break all game. Though the stars are great, Clapham wins, as always, with their depth. Fred Shone was able to get a block on the first Clapham D-line point against both CUSB La Fotta in semis as well as Bad Skid in the final. Chris Baker had the best throw of the tournament and Magnus Wilson made a phenomenal grab. The problem is that Clapham is class all the way through its 26 players and can keep throwing fresh lines out while other teams need to play their top 10 players to even stand a chance of keeping up. Over and over again, teams manage to stay close in the first half with Clapham while Clapham run away with the second half. Clapham was up 8-6 on La Fotta in the semi before going on a huge run in the second half to end up winning 15-9 by the end. They were only up on Bad Skid by one break (8-7) in the final before starting their second half run to make it 15-11. Teams simply cannot keep up, and they haven’t been able to for years. It was tough to say how Bad Skid would do at this tournament as the team stayed away from most of the high profile international tournaments this weekend. This, coupled with the absences of Nico Müller and Christophe Köble, brought doubts as to where this team would finish. However, on their year off, they managed to pull off their best result since the club began. They made it all the way to the final in Caorle getting themselves a silver medal for the first time in the club’s history. 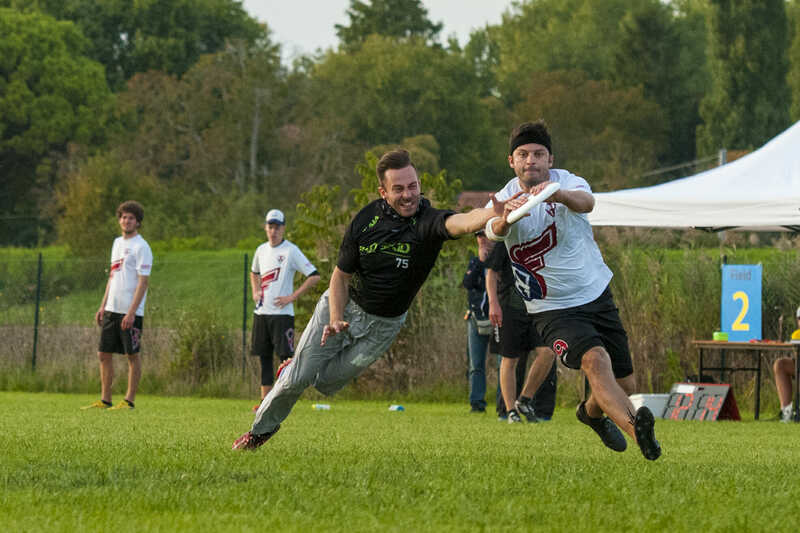 Most players had put in years of energy since 2014 with campaigns to the WUCC and as players on the national team at the EUC and WUGC in the previous years so this year they decided to stick to pushing each other at practice and secure a German title so that they can compete in Cincinnati next year. The team still has a lot of talent with Marco Müller, Florian Böhler, and Jörg Reinert making big contributions in addition to the trio of Beuttenmüllers: Holger, Samuel, and Michael. They also added a number of new younger players like Simon Hiller, Kevin Schanz, and Frieder Kurrle, who are just starting to get used to this new level. The current Bad Skid stars all started through youth teams in the Heilbronn region and those youth scenes are still strong and generating new stars to keep Bad Skid healthy for years to come. The last non-Clapham team to take a European crown are Flying Angels Bern from Bern, Switzerland. They did this back in 2011 and have been slipping slightly ever since. In 2015, FAB finished 18th and last year they managed to get back to quarters but still finished 7th. However, this year was different. FAB managed to place third after some very compelling games. Though they barely squeaked through a win against M.U.C. on double game point in pool play and eventually lost the pool to Chevron Action Flash, this actually gave them a slightly easier lineup in bracket play. Their road went PirU (15th) – Tchac (7th) – Bad Skid (2nd), while winning the pool would have given them Ragnarok (5th) – CUSB La Fotta (4th) – Clapham (1st). Once they got to bracket play they started to look like the dominant FAB of old. Their older players like Lorenz Stauffer, Jan Tenge, and Dominik Odermatt are still crucial to their offensive flow. However, they are finally getting good contributions from players below 35 in the much younger Schmidt brothers, Lars and Jan, as well as Sebastian Gloor, who was phenomenal all weekend both defensively and offensively. They pushed through bracket play by dispatching PirU and then having to face Tchac. Lucky for the boys from Bern, Tchac were missing key offensive playmaker Eric Becker. This game was an absolute thriller: some said it was the best game in the men’s division this tournament. FAB was able to sneak through to semis, winning on double game point with great handler movement by Tegner and Gloor. Next up: Bad Skid in the semifinals. They managed to take a lead early but Bad Skid brought things to double game point and eventually ended FAB’s impressive attempt to the final. They then put to rest any doubt that they arrived at the semi because of luck by defeating CUSB La Fotta in the Bronze medal match, taking home hardware for the first time in quite a few years. FAB are still relying heavily on their old guns, but they finally look like they have the young blood willing to step up and it will be interesting to see how this team continues when some of their ageless stars will inevitably retire in the coming years. Outside of Clapham, the race for 2nd place was a crazy one. Bad Skid and FAB did get there but had to squeeze through double game point wins to get there. Copenhagen’s Ragnarok also impressed by giving Clapham their most competitive game of the season and taking CUSB La Fotta to a thrilling double game point finish in quarterfinals. Speaking of La Fotta, their offense looks absolutely deadly and will only get better as their campaign moves with its eyes set on WUCC next year. FWD>> from Vienna, Austria, also made it to quarters for the first time in their history and their offensive line is one of the more complete and disciplined ones in Europe. Of course, they rely on stars like Jan Nowak to make ridiculous plays, but everyone on that line has a distinct role and their 6th place finish is something they can be really proud of as they continue to grow. France’s Tchac are surely unhappy falling from a Bronze medal finish last year to 7th place but they had flashes of brilliance throughout the tournament and given that they were missing a key player after prequarters, they should still attack next season with confidence on their road to WUCC as well. The margins between any team from 2-7 were absolutely razor thin. This bodes well for the future of the division but the question still remains as when will a team finally be able to push through to dethrone the British kings of Europe. Comments on "EUCF 2017: Tournament Recap (Men’s Division)"